The Expedition EL can move a one-bedroom condo, if that's what you need. Do you really need that capability every day? Old school is in session: The 2017 Ford Expedition teaches a few lessons to today's crossover SUVs with twin-turbo power, luxury-truck touches, and big towing and hauling numbers. Who would have guessed that full-size SUVs would survive $4 gas, or a deep recession? The same people who picked the Cubs in the World Series. Those are the kind of folks you want to hang out with, eat a meal with, but mostly, hit the craps tables with. The Expedition isn't just surviving, it's thriving. In 2015 it subbed in a whomping turbo V-6 for its V-8, gained an adaptive suspension and a new infotainment system, and slathered on a fresh layer of luxury touches. A decade or more past its last, serious redesign, the Expedition hasn't ever been better. This year, the 2017 Expedition doesn't do much to break its streak. It's offered in XLT, Limited, King Ranch, and Platinum models, and the last of those gets standard adaptive shocks and 22-inch wheels. The Expedition's body saw only light retouching in the 2015 model year, but it didn't need much more. The bluff grille, the big chrome bars, the resolutely squared-off body—they're all on point, for what it is and for what it's meant to do. The post-update cabin now has touchscreens and digital displays, as well as the Sync 3 infotainment system, mounted high on prime real estate. It's paired with two 4.2-inch color screens that flank the gauges. A cleaner dash design wraps it all into a cohesive whole. The Expedition's impressive twin-turbo V-6 will make you forget the charms of the old naturally aspirated V-8. The 3.5-liter twin-turbocharged V-6 is on loan from the F-150 lineup (and from Ford's crossovers and sedans, too). The 365-horsepower turbo V-6 even growls while maintaining the SUV's strong 9,200-pound tow rating. The power's not explosive, but the Expedition is now a truly quick vehicle, despite its mass and height. The new powertrain helps the Expedition in the EPA derby too: the new SUV is rated as high as 21 mpg combined, good for its size but mediocre in the wider view. With aluminum-bodied, 10-speed F-150s in the mix, it's pretty certain the Expedition will head in that direction in its next complete revamp. Turbo power is just part of the reason the Expedition performs so ably. A continuously damping suspension is now available, and it offers three modes—comfort, normal, and sport. Along with electric power steering, the sophisticated suspension boosts the Expedition's reputation as a brute 'ute that rides and handles better than most of its rivals. It's a shame the new adaptive shocks only are offered on the most expensive versions, but for 2017 they're now standard on Platinum models. Expedition SUVs come in standard and long-wheelbase EL spec. With the Expedition EL you gain 14.8 inches longer overall, with longer rear fenders and glass. It's one of the biggest SUVs on the planet, frankly, and its wheelbase of 131 inches is longer than the full length of either a Smart Fortwo or Mitsubishi i-MiEV. With either version you get an almost van-like interior and loads of passenger space in the first two rows, but cargo space is more abundant and third-row access is much easier in the EL. Just beware that you’ll pay the price in maneuverability and parking ease. The Expedition is sold in four trim levels: XLT, Limited, King Ranch, and Platinum. All come with the usual power features, Bluetooth, the rearview camera, and USB ports. Platinum models soar past $61,000 and can be fitted with a wine-color Brunello leather with tuxedo stripes and French seams; seven-color LED ambient lighting; Ford truck apps for towing; and a ten-speaker, 700-watt Sony sound system. The Expedition's 2015 changes were perfectly timed, just as GM was refreshing all its large SUVs with gas-saving powertrains, new safety and technology, and a cleaner look. 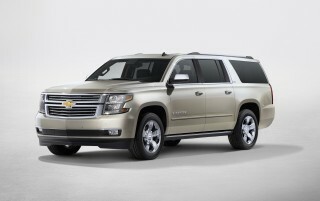 The Expedition counts all those vehicles—Escalade, Yukon, Tahoe and Suburban—as its main rivals. In our ratings, the Expedition outpoints the GM 'utes, and other full-size SUVs, even though it's more a case of gradual improvement than radical reinvention. The Expedition's styling has aged gracefully. Despite an outline that hasn't changed substantially in 15 years, the Expedition still cuts a fine figure. Among full-size SUVs, styling doesn't have to be cutting-edge or extravagantly detailed to look good. The Expedition proves that out. Ford retouched the Expedition in the 2015 model year, but everyone outside of Dearborn, Michigan, is excused for not noticing. The grille grew thicker, in an attempt to keep up with the new aluminum-bodied F-150, but the silhouette remained the same. It's still clearly a member of the same truck family, with bluff front ends, massive grilles, and enough straight edges to supply a nation of architects for years to come. The Expedition's cabin has been updated regularly over the years, and top versions are now nearly as plush as those in Ford's own Lincoln Navigator, particularly at the Platinum trim level. From a design and functionality standpoint, the starkest reminder of the Expedition's age is plunked right in the center of the dash, where the new Sync 3 infotainment system has been installed. It's the interface that runs on the Expedition's 8.0-inch screen, and on two 4.2-inch color screens flanking the steering wheel. It's integrated well, but can't help but look like an incongruous add to this big SUV's kit. It's surrounded by a clean center-stack design that gives the Expedition's dash a more cohesive look than it once had. With layers of woodgrain and metallic trim, pricey Expeditions have a convincing look of quality without looking pretentious. The Expedition drives like a smaller SUV, and its twin-turbo V-6 can run and gun. The Ford Expedition does a commendable job at its critical mission: hauling people and towing heavy things. Beyond that, its twin-turbo V-8 is powerful, its steering quick, and its ride, composed. Of all the full-size domestic SUVs, it's the surprise performer, despite its aged chassis. 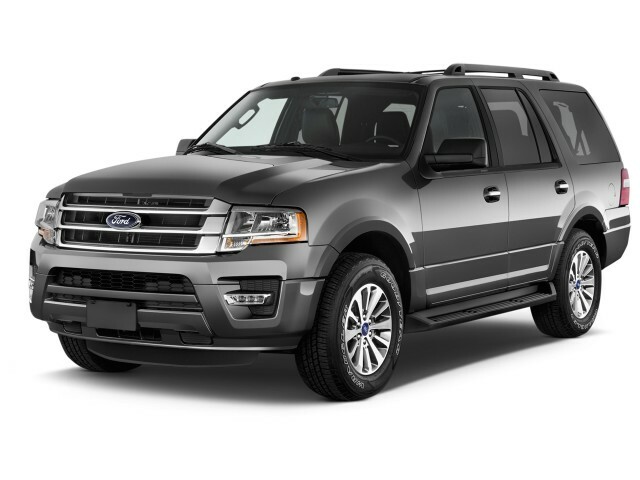 Back in the 2015 model year, Ford exchanged the Expedition's V-8 for a twin-turbo V-6. It was a profound change for the better. Ford's former V-8 was down on horsepower and torque to its rivals, especially at the low end of its rev range. The twin-turbo 3.5-liter V-6 cranks up the spec sheet to 365 hp and 420 lb-ft of torque, and better yet, it delivers copious power down low. With 0-60 mph times clocking in at less than 6 seconds, the Expedition is truly quick, and its engaging turbo soundtrack has an appeal all its own, even if you believe in the higher power of naturally aspirated V-8s. Fuel economy's even gotten better, at up to 21 mpg combined. Four-wheel drive remains available throughout the entire lineup, and the 6-speed automatic transmission is responsive and smooth-shifting. The Expedition also maintains tow ratings of up to 9,200 pounds. The Expedition's power propels it, but the hardware inside its massive wheels makes better chicken salad out of that chicken salad. 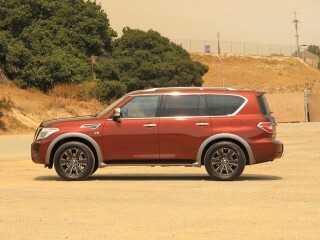 Driving the Expedition is easy, even for drivers used to smaller crossover SUVs, thanks to light but precise steering. It's sharper and quicker than ever, thanks to an electric motor's assistance. The Expedition's suspension does a good job in controlling all that weight. Yes, it's one of the biggest land yachts on the market, but it's manageable. Copious space is the hallmark of the Ford Expedition, and it's better arranged than in GM's full-size SUVs. The Expedition doesn't just tow and haul. It's a full-size van replacement, with seats for as many as eight passengers and cargo space for all their belongings, even on short-wheelbase versions. In either standard or long-body EL form, the Expedition sets things off on the right foot with wide, well-cushioned front seats. Smaller drivers can tailor it to their needs, thanks to power-adjustable pedals, a telescopic steering wheel, and of course, a high driving position. Leg and knee room are expansive in both the first and second rows of seats, and adults can even fit in the third row for short trips, though the leap between the second- and third-row seats isn't graceful or easy. On the quality front, Ford still uses plenty of semi-glossy, open-grain black plastic all over the dash and door panels, but the fit is generally good, and there's more soft-touch trim this year, as well as much more sound deadening and attention to quieting the cabin. On Limited and more expensive versions, the Expedition doesn't give Ford's own Lincoln Navigator much room for bragging rights, in terms of fit and finish. The Expedition has a few blemishes on its safety record. Size matters, and the old adage expresses itself in good and bad ways in the Ford Expedition. The Expedition gets some good crash-tests scores, due to its size--but earns a very low score in one test, again because of its size. Safety equipment has been expanded to include side airbags, Bluetooth, and a standard rearview camera. Ford's programmable MyKey system allows parents to program a speed limiter, speed alert chimes, and additional belt reminders. The Expedition also includes stability control with programming to limit trailer sway. When sway is detected, the Expedition applies precise braking and reduces engine torque to bring both vehicle and trailer under control. The Expedition's outward vision is a clear step above its rivals. The Expedition's glass areas are tall, and offer a less obstructed view to the sides and to the rear than the current Cadillac Escalade or GMC Yukon. The Expedition doesn't lack for many features; Platinum models are Lincolns in all but name. If you're just into the Expedition for towing, and won't use it as a butch luxury concert-goer, Ford will build you a base Expedition. Even that model has a lengthy list of standard gear. Stock an Expedition to the Platinum limit, and you'll probably wonder if you should just buy the similar Lincoln Navigator for a few grand more. It all starts with the Expedition XLT, which comes with standard power windows, locks, and mirrors; cloth seating; power-adjustable pedals; front and rear climate control; Ford's Sync system, with Bluetooth audio streaming, a USB port, an auxiliary audio jack, and AppLink; satellite radio; steering-wheel audio controls; a rearview camera; rear parking sensors; cruise control; flip-up tailgate glass; and 18-inch all-terrain tires. The XLT can be configured with leather; power front and passenger driver seats; power-folding third-row seats; a power tailgate; and a towing package. It's the strongest value in the family. The Expedition Limited adds Ford's Sync 3 infotainment system, and its much quicker, easier-to-interpret interface. It comes with an 8.0-inch touchscreen, voice command capability, and two USB ports. The Limited also gets automatic climate control; perforated-leather front seats with heating and ventilation; heated second-row outboard seats; a power-folding third-row seat; woodgrain trim; remote start; front parking sensors; keyless ignition; and 20-inch wheels and tires. 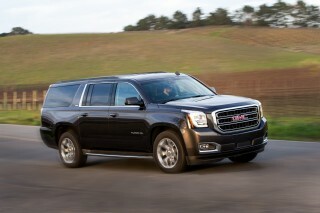 Options include navigation with HD radio; a power sunroof; and power-deploying running boards. Generous budgets will want to spend up to the King Ranch Expedition. It has a visually tasty, untreated leather interior that looks and feels and even smells like a baseball mitt, and requires upkeep, showing the warts and scuffs accumulated through the miles. The King Ranch also gets a standard blind-spot monitors; a power tailgate; remote start; and 20-inch wheels. Options include 22-inch wheels; load-leveling rear suspension; sunroof; power running boards; and second-row bucket seats. The Expedition Platinum tops off the SUV with almost everything available in the brochure, leaving only a few options: the load-leveling rear suspension; Brunello leather interior; second-row bucket seats; and a DVD entertainment system. The adaptive shocks and 22-inch polished aluminum wheels that were options last year are now standard. By that time, you're well over the $60,000 mark, not far from the base price of the Navigator. 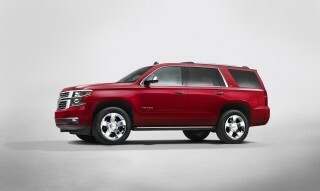 Fuel economy is about what you'd expect for a powerful full-size SUV. The Expedition swapped out its V-8 for a twin-turbo V-6 in the 2015 model year—and fuel economy figures rose a little bit. Without more radical change—like maybe an aluminum, F-150-like body—there's only so much a slightly more efficient drivetrain can do. The Expedition still consumes a lot of fuel to do what it does. 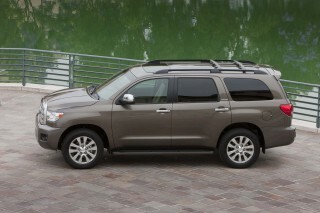 When it had a V-8 last, in the 2014 model year, the Expedition posted EPA ratings of 13 mpg city, 18 highway. Now the same model is rated at 15/20/17 mpg—or, with rear-wheel drive, at 15/21/18 mpg. On long-wheelbase models, the numbers are still better than in the V-8 days: at 15/20/17 mpg for rear-wheel drive, and 15/19/16 mpg with four-wheel drive.